The government has promised a review of teaching reading in England's primary schools, particularly looking at a method called "synthetic phonics". But what exactly is it? Most schools in England already use a version of phonics - where children are taught the sounds of letters to make up words. But teachers use that approach with a combination of others, such as encouraging children to work out what a word might be from the context such as the pictures on a page or the use of repetition of particular words. In the past children might have been taught to learn whole words first, probably using flash-cards, and then they were given books which had the words they had learnt in them. With phonics generally, children learn to read using the sounds of letters rather than the names. So a letter 'D' is said 'duh' not 'dee'. So far so good. But there are two main types of phonics - analytic and synthetic. In analytic phonics, children are taught whole words and later analyse their constituent parts, such as c-at or str-eet. In synthetic phonics, the key is to teach them sounds of letters and letter combinations first, then combine those to form words: c-a-t or s-t-r-ee-t.
Primary school teacher and literacy expert Kate Ruttle believes both methods are being used in schools, alongside several other approaches to reading, and the debate is an academic one. "Most parents will find their teachers are using a version of phonics already," she said. "Most teachers do both synthetic and analytic phonics and 90% of teachers probably don't know the difference between the two. It's something the academic world argues about. "Teachers will vary their methods depending on the needs of their class." Ms Ruttle is an editor of the Oxford Reading Tree - a reading scheme used in many English primary schools. She does not believe in promoting just one approach to reading - and says the existing national literacy strategy is not opposed to phonics, it is just not prescriptive. With synthetic phonics, children learn 44 sounds of letters or groups of letters before being allowed to look at books which have those sounds in them. Under the national literacy strategy, primary school children need to spend an hour a day on literacy. Teachers are encouraged to use phonics alongside other methods. In Clackmannanshire, Scotland, 300 children were taught to read using the synthetic phonics method and were found to be well ahead of children taught in other ways. At Menstrie Primary School, children were given intensive instruction in synthetic phonics for 16 weeks as soon as they started school. By the age of 11, they were more than three years ahead of their peers in reading age. Head teacher Veronica O'Grady believes this method is better than what was being done 10 years ago. "Teaching synthetic phonics gives children strategies for reading and writing that they wouldn't have had at the early stages using other methods." She added: "They have no fear of attempting to read new words or write a simple sentence. "These early gains seem to last - even at the top of the school boys are reading and writing as well and as enthusiastically as girls." 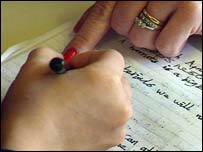 Opinion is divided on whether children should learn to read using only synthetic phonics. Dr Dominic Wyse, a lecturer in primary and early years learning at Cambridge University, believes children also benefit from having words put into context, so that they can fully understand what they are being taught. He told the Today programme on BBC Radio Four he was concerned about some approaches to synthetic phonics, where he claimed children were being denied books. Dr Wyse rejected suggestions that phonics had been abandoned entirely by many schools in favour of other methods. "To claim that phonics has been neglected is always exaggerated. My evidence is that over time no more than 4% of schools nationally have neglected phonics teaching perhaps for some other method, such as whole language teaching. "There are trends of course in theory and so on, but basically phonics has been a part of our reading curriculum for a very long time". Are children's reading skills good enough?